Dr. Kim Duk Han presented about New technique called ThermiRF that skin tightening and lifting treatment using radio-frequency energy. They use probe is inserted underneath the skin and delivered heat in dermal layer. At the temperature range in deep dermis, collagen production is increased and stimulated.It' a new technique and approved FDA in Australia and United States. The doctor Kim explained introduction of ThermiRF at the beginning. 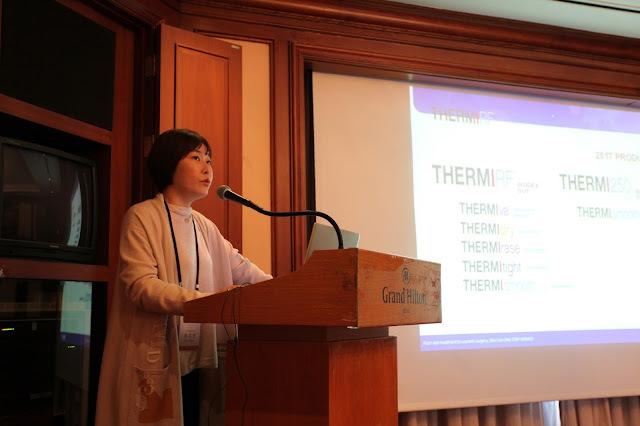 Dr. Ha Ji Hyun presented about Application of ThermiRF. ThermiRF is applied to various area such as face, body and hyperhydrosis, and varginal for female. It is mainly tightening for wrinkles on the face and even breast, legs etc. She talked about ThermiRF various types of examples and applications for treatment each targeted area. 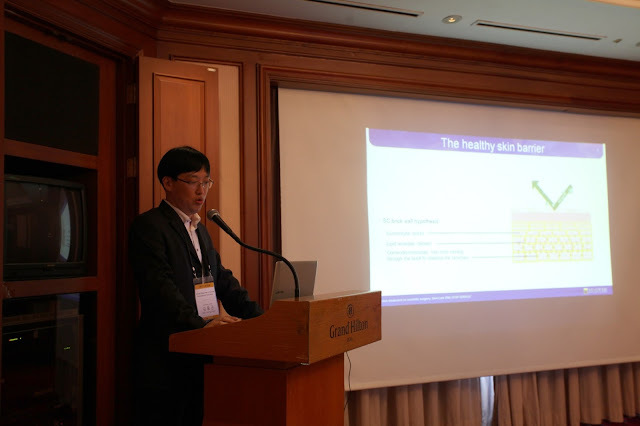 Dr. Yang Yoon suk presented about DNA-selfcorium which is called DNA Dermal rejuvenation for Acne scar and other scars like chicken pox, accident scar, and nail mark and other light wounds that can easily occur in daily life. Our doctors in Renweme skin clinic studied DNA self-corium thought research. DNA-Self-corium helps Acne scar and scars in both inner and outer layer of skin together at once. If you have one session for Dermal rejuvenation at renweme, you can have improvement and good results. 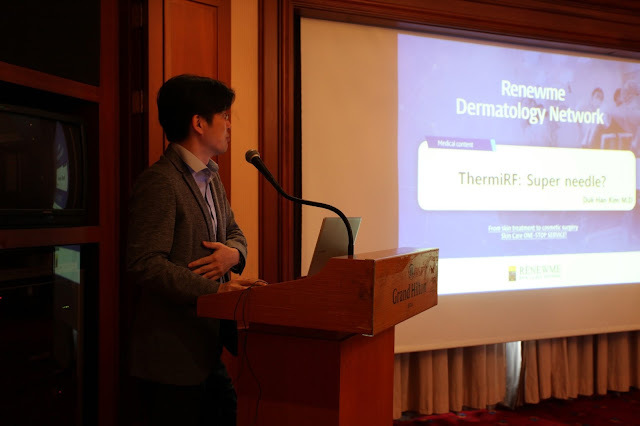 During the seminar, renewme doctors and other doctors from other countries disscused treatments we have such as ThermiRF, DNA dermal rejuvenation etc. They explained how treatments is more effective than now and also shared their applications and own experiences together. Dr. Kim Jung Geun presented about Practical Uses of Protopic in dermatology. He talked about the cause of Atopic dermatis and methods of prevention. Also, he talked about Topical steroid for Atopic dermatis. He explained how we prevent from side-effect from topical steroid. 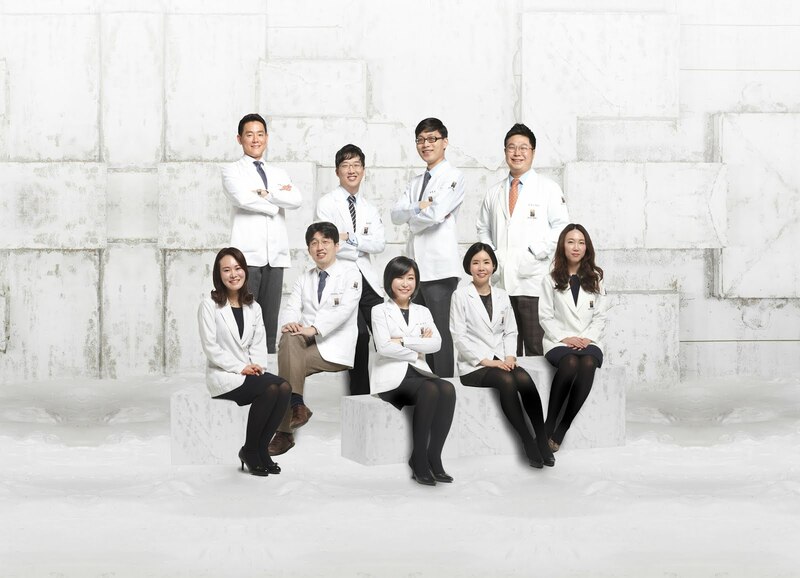 Dr. Choi had the topic of laser treatment for Onychomycosis. We also called Tinea Pedis for toe nails. Renewme have Pin-Point laser for Tinea pedis. Last time, it was only treated by Oral medication and ointment cream, but it's possible to treat it by Pin-point laser. 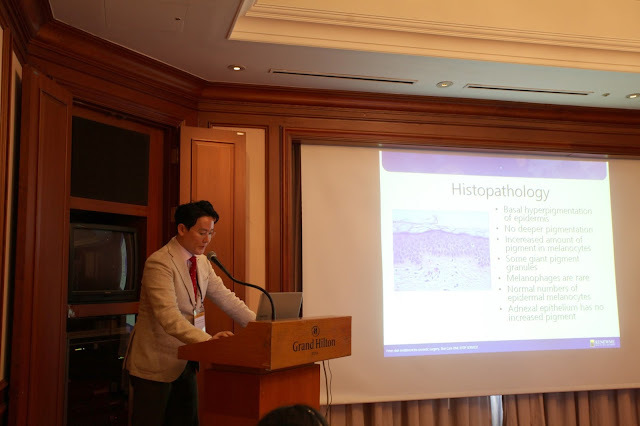 Dr. Kim presented about Hyper-pigmentation like birthmark by using Nd:Yang, Low Energy. Renewme have many patients who are treated for hyper-pigmentation. The doctor expained own experiences and shared his methods of treatment by Forona, and Nd:Yang laser. The topic from Dr. Kim was about Filler and botox. It seems to be simple treatment as beauty treatment. But, it should be cautious because it's injectable treatment. The Dr. Kim explained what is safe and effective for each area at renewme. Dr. Ko presented about wrinkle improvement and lifting treatment. She explained various types of thread lifting like PDO, PLLA Thread with HA filler. In our clinic, we do have treatment for filler, laser, thread lifting etc for ONE-ON-ONE consultation with patients. After the presentation, we moved to Renewme Honje clinic and we prepared for the hands-on course. We looked forward to having a live demonstration in the clinic. I will talk about the next step for Live demonstration from next posting.